Stobi was an ancient town of Paeonia, later conquered by Macedon, and later turned into the capital of the Roman province of Macedonia Salutaris (now near Gradsko in the Republic of North Macedonia). It is located on the main road that leads from the Danube to the Aegean Sea. Stobi was built where the Erigón River (mod. Crna) joins the Axiós River (mod. Vardar), making it strategically important as a center for both trade and warfare. The first historic records to mention Stobi are by the Roman historian Titus Livy (ca. 197 BCE). According to Livy, Stobi became an important center for salt trading after the Roman conquests of Macedonia and the establishment of Pax Romana. In 69 CE, Emperor Vespasian granted Stobi the rank of municipium and the right to mint its own coins. 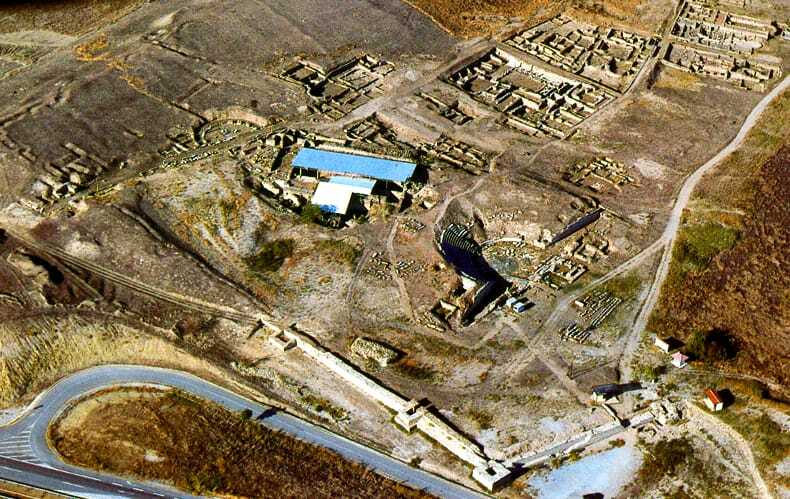 Stobi was not only an important salt trading center, but also was located at the crossroad of the ancient roads that ran along the two rivers Axios and Erigon. The first road connected the North and the South of the Balkans as it does today, while the second to the southwest connected Stobi with Via Egnatia near Heraclea Lyncestis and to the northeast, it continued to Serdica. This fortunate position brought Stobi long-term prosperity, especially in the period between the 1st and 3rd centuries CE. Several monumental buildings in the city are dated to this period: the Theater, the first City Wall, Porta Heraclea, Public Building with Arches (most probably the Stobi library), Casa Romana, the Synagogue, as well as the water supply system. In 267 CE, the city suffered Goth and Herule raids. At the end of the 3rd century Stobi was devastated by an earthquake. It was later rebuilt, but following a different urban plan. Most of the ruins visible today belong to buildings dated to this period. During the 4th century CE, Stobi became an important Christian center and the seat of powerful bishops. In the 5th-6th centuries CE, Stobi was the capital city of the Roman province Macedonia Secunda but suffered from the raids of Huns, Ostrogoths, Avars and Slavs. The constant threat of barbarian raids, as well as certain climatic changes, lead to the gradual abandonment of the city in the second half of the 6th century CE. Some records mention a small Slav community that settled and lived there in later centuries. The last historical reference regarding Stobi describes the victory of the Byzantine troops over Stobi’s local militia during the 11th century CE.